Paint your own masterpieces while avoiding the cops. Paris-based indie developer Théo Le Du Fuentes goes by the name of Cosmografik, a fitting pseudonym for the creator of Vandals, a turn-based puzzle game that focuses on street art. Arriving on iOS, Android, Mac and PC on April 12th, it's being co-produced and published by ARTE, a public European TV and digital network founded in 1992. ARTE's chief of web and video, Adrien Larouzée, says that the company is interested in media that helps us get to know more about other cultures and peoples through telling stories, and Vandals fits the bill. Along the way, you'll come across various bits of history regarding street art and the artists who have become famous for it. There are photos of the artists and their work along with descriptions and informative text to peruse either as you find them in each level or as a larger archive accessible from the main menu. 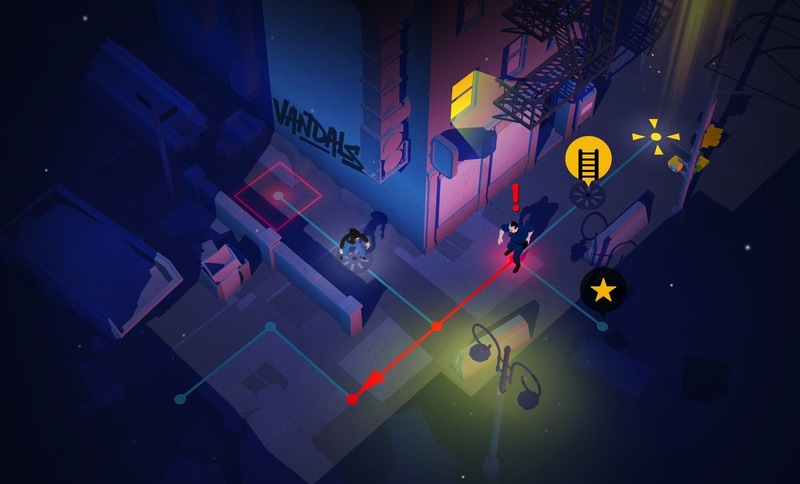 Ostensibly a stealth game, Vandals has you avoiding the cops and painting the walls in different cities like Paris, New York, Berlin and Tokyo across 60 levels. It's turn-based, so you can think through your strategy and plan your path to gather as many extras as possible while trying to exit the level. Le Du Fuentes (who also made Type:Rider) said that Vandals' main levels will take most people around four to five hours to complete while gathering all the extra bonuses could take up to 10 hours. In the iOS version, you swipe toward an adjacent node; your character walks to that space and any enemies move as well. You'll need to pay special attention to the environment too. Sometimes you'll need to toss a bottle behind a policeman to distract him. Other times you'll have to drop into a manhole to pop up elsewhere, out of sight of a city camera or police dog. Each area has the same final task before you can leave: Draw your own painted street art. Once you make it to the end of each level, you'll use a set of tools familiar to anyone who's played with an art app before. You can draw freehand to produce anything you want using your finger in the mobile version or the mouse on your computer. These "masterpieces" can then be shared on your favorite social network. Le Du Fuentes noted that despite this freedom, there haven't been any drawings of male genitalia (though I have no doubt that will probably change once the game is released to the general public). The art uses both muted and bright colors to lead you to your goal; the result is a noirish feel in each city, with each soundtrack providing a sense of place. The Paris levels sound like jazz from the 1920s, while New York levels have a distinct saxophone-and-bass-fueled background. Vandals is a beautiful game and almost relaxing to play. The turn-based structure allows for a more meditative approach than other real-time stealth games, and you can always try levels again if you don't solve the puzzle the first time. ARTE's Larouzée noted that there is typically more than one way to "beat" a level, too, which allows for creative problem solving rather than trying to find a singular solution. If this sounds like your thing, you can pre-order Vandals on iOS right now for $3.99. The Steam version will run for $5.99 when it is released later this week on April 12th, and in keeping with its international theme, the game supports English, French, German, Spanish and Italian. Rob LeFebvre is an Anchorage, Alaska-based writer and editor who has contributed to various tech, gaming and iOS sites. He has two teens, four dogs, a cat, a couple of life-partners and too many video game consoles. He plays guitar in a disco band, tries to write sci-fi novels and generally avoids the snow and cold as much as possible. Feel free to find Rob on Twitter @roblef and send him a taco once in a while; he'll really appreciate it.